At the age of eighteen he decided to dedicate himself full-time to violin making, entering his father’s workshop and enrolling with the ALI Professionisti in 2001. 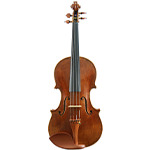 He had the chance to meet several well known violin makers and to spend a considerable amount of time in the United States, working in violin-making workshops, such as Christophe Landon in New York, in Washington DC, Texas and taking Varnish and Acustic Masterclasses in Oberlin (Ohio). This gave him the opportunity to learn restoration techniques and to admire original old instruments. For the construction of his instruments he uses the moulds and models from his family’s workshop, most of them originally belonging to Carlo Bisiach’s collection, once owned by Igino Sderci. 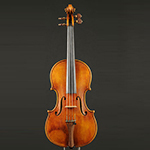 The wide variety of models employed in the Vettori’s workshop is consisting of Guarneri “del Ges?”, Pietro Guarneri da Mantova, Stradivari, Carlo Bergonzi, Camillo Camilli, Balestrieri, Nicol? Gagliano, Francesco Mantegazza, Domenico Montagna, Giuseppe Guarneri “filius Andreae” and many others. Dario mainly uses ?local and Bosnian maple (some of which were left by his grandfather), Italian poplar, willow, cherry and pear wood as well as the traditional violin-making spruce from Val di Fiemme. He occasionally succeeds in finding old wood, which, according to analyses carried out at the University of Tuscia in Viterbo, comes from trees dating back to the 17th century. Still today the family preserves its own tradition started by "Grandfather Dario" in 1935.